Crocheted lace tablecloths are not difficult to make, but they are time-consuming. The reward for the time spent in hand-crocheting little medallions or working seemingly endless rounds of crochet is a one-of-a-kind heirloom that will be handed down and treasured for generations. Although every pattern for a crocheted tablecloth is different, there are some basic strategies that will make your work easier and more rewarding. Buy all of your thread at once. 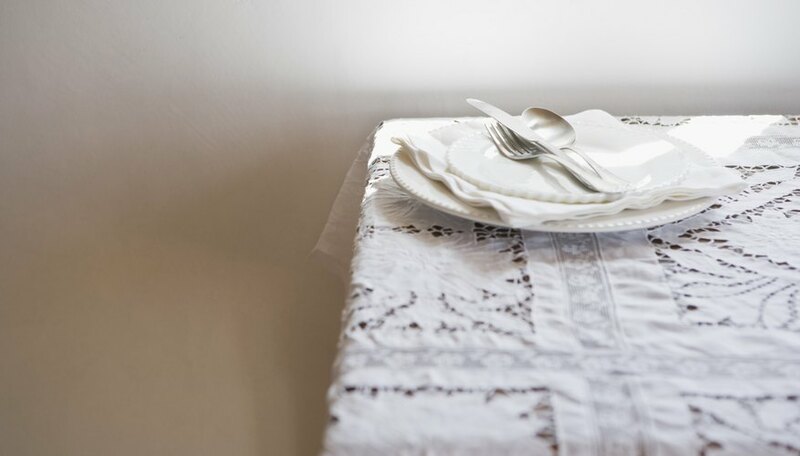 Even if you're working with white cotton crochet thread, there may be differences in texture and color that will affect the quality of your finished tablecloth. If you're working a tablecloth in one piece, invest in a row counter to help you keep your place in your pattern. Work a test square in the main pattern to check your gauge. Gauge is the number of stitches and rows that you get to the inch of work. Because every crocheter works differently, your gauge may vary from the gauge required for the pattern. Crochet a 4-inch square in the main pattern stitch, and count the number of stitches to the inch. If it's different than the stated gauge for the pattern, repeat with a smaller or larger crochet hook until you get the right gauge. If you are working on a tablecloth that is worked in rows, use a row counter to keep track of your place in the pattern. If you are working with a chart in filet crochet, draw a line through each pattern row as you complete it. Each successive round includes an increase in stitches to keep the work flat. In a square or rectangular pattern, the increases are worked at the corners. In a round pattern, they are worked evenly throughout the round. Pull a piece of colored yarn through the first stitch as you begin each round so you'll know when you reach the end. Read through the pattern to make sure that you understand the way the tablecloth is put together. There are three basic methods of making a crocheted tablecloth--worked in one piece, worked as separate pieces that are sewn together after all pieces are completed or worked in pieces and assembled as you go. If your pattern calls for motifs in different sizes that will be joined at the end, keep each size in a separate bag so they'll be easy to find when it's time to join them. When all motifs are completed, lay them out on a flat surface to check size and assembly. If the pattern doesn't specify a method of assembling the lace tablecloth, pin the motifs to each other and sew them together in strips, then join the strips to each other. Finish with a border as directed in the pattern.